At birth, Izzy appeared perfectly healthy. But the following day, as a nurse administered a hearing test, her lips turned an ashy-grey. Izzy’s oxygen saturation level had fallen to just 60 percent. She was moved to the Neonatal Intensive Care Unit, and was later rushed to Rady Children’s where she was diagnosed with Transposition of the Greater Arteries (TGA). In this rare but serious heart defect, the two main arteries leaving the heart are reversed. Blood cannot circulate properly, leaving the body’s organs severely lacking much-needed oxygen. Without immediate treatment, the congenital condition can cause serious complications, including death. Izzy immediately underwent cardiac catheterization to help improve the mixing of oxygen-rich and oxygen-poor blood. And then, at only 6 days old, she underwent open-heart surgery where surgeons aligned the aorta and pulmonary ventricle with the correct chambers of the heart. She made an incredible recovery and was released from the hospital in time to be home for her first Christmas. 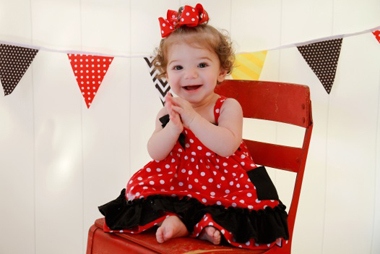 Today, Izzy is a happy and strong 1-year-old who has made a full recovery from her early setback.